O what a little spray paint can do! We've had this lovely mauve lamp beside our bed for years. I decided to try and update it... so glad I did!!! Love how she looks now. A bit more updated, simple, and a lot less mauve! Don't you LOVE Pinterest! I do! It's so addicting and one of the biggest social media sites out there. Here are 9 tips that will help you in marketing your website on Pinterest. 1. Plan for Success - Be sure to properly set up your account and create Boards that will apply to your niche market. 2. 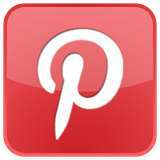 Be Social - Pinterest is a visual social media website. Meaning you need to interact with others. Follow others, comment on their pins, thank others for re-pinning your pins and create relationships. This will enable you to gain a strong following. 3. Invite others to Follow You - We've all seen those Follow me on Pinterest buttons. Be sure to add your own on your blog and other social sites. This is a great way to gain exposure! 4. Pin It - Along the same lines as having others follow you on Pinterest, you need to have a Pin It Button on your blog so others can Pin your images. Be sure your creating quality material to be pinned. 5.Create larger images - Grab attention by having longer images. This will take up more space and gives you more screen time. 6. Remember your SEO - Search Engine Optimization is so key to being found. Use #hashtags, keywords and url's in your pins. 7. Promote Creatively - Add a call to action in your pins... Something like "Pin if you agree" with a favorite quote. 8. Pin Different Image Types - photos, images, text and even videos! 9. Be Copyright Savy - Don't pin images that have copyrights - you can get yourself into trouble. On your own images be sure to add your website address and link back to your page. UPDATE: This Articel was just Featured on Divine Caroline's Home Page! Hop over and check it out. So I started out by making 4 square boxes out of 2x4's. We had a stack of old picket fence planks. I picked the past of them, cut to size, scraped off the old paint, screwed them into my frames and re-painted. I've been seeing these super cute lanterns on Pinterest as well. So I made a few for myself. I also made this fun sign that is hanging outside the walk in door along with scrubbing, repainting and putting a new light bulb in the outside fixture. Several more things yet to do but it's feeling so much more finished day by day.